Ask yourself if you’re a serious golfer. If you are, not just owning the best products is a must — but owning products with your name on it is a definite. The thing is any golfer won’t simply rent the stuff for an outing here or there. No, they buy the stuff — and then put their name on it. Which is why some of the essentials — such as branded divot repair tools — make for a great addition to your repertoire, covering all the bases at a golf outing. The ultimate job in labeling, too. You know they’re yours. No one else’s. 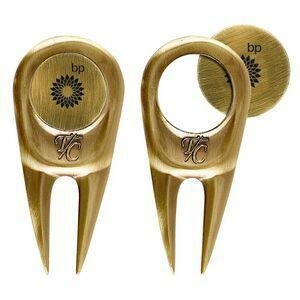 Order them at BRAVA Marketing, and you’re set for any of those instances the divots need repairing. Have your caddy pull them out, and you don’t need to make a run at the country club’s lobby for some of their divot repair tools. No, you have your own! You’re set. Being a golfer ultimately gets you that sense of ownership. Almost like owning your own fishing pole, or pool cues. This is the feel you want as a professional golfer. When you get to own your own equipment, you know you’ve made it. And now you can get all of it right at BRAVA Marketing. Find them right here. A large assortment of designs are available. When you’ve found the kind of branded divot repair tools you want, all you need to do is contact us with any questions you have. Competitive pricing, branded in your name (or whatever you like), and delivered directly to you!